Who is fighting on the streets in Kyiv? Radicals? Nationalists? No, this is the war of middle class and civil society, freelancers. journalists, NGOs, IT workers, artists, students and old people, who have nothing to lose. Kyiv Euromaidan is a sort of internal domestic exile from a totally fraudulent political and economic system. 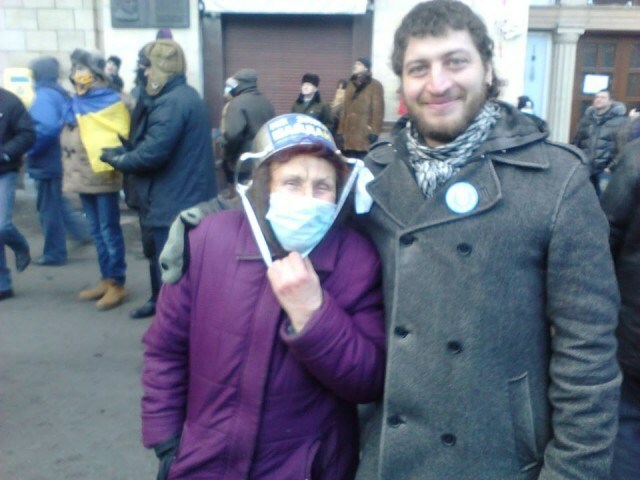 MMIC Board Member Boris Zakharov with one of freedom fighters in Kyiv. Mask to protect her from tear gas. What do people want and what they could actually get? People want freedom – political freedoms (freedom of assembly, freedom of speech, freedom of conscience, right to non discrimination etc. ), freedom from Russia and freedom from nepotism which is the current regime. The number of people ready to die for it increases daily. What is the significance of the protests for Ukrainians, that were not on the streets since they can remember? This is an ultimate fight for independence of Ukraine and for civil freedoms. There had not been such determination to fight for it since 1918. All protesters clearly see the direct Russian influence behind the actions of Ukrainian government and have all reason to suppose the independence of Ukraine is at stake. Why you think there was no determination to fight since 1918? What has changed in the mindset or feelings of the Ukrainians? We, Ukrainians, are weird people, We can tolerate the evident injustice for many years. However we arise at the sight of blood and ultimate idiocy. The more the enemies try to frighten us brutally, the more we are determined to fight back. The U-Turn in the EU integration (ultimate idiocy), the brutal bloody beating of protesters in November 30 2013 and December 1 2013 and the outrageous curtailing of civil rights with the “laws” of January 16 2014 put us to the point of no return. The resistance is the survival both of a nation and of personal integrity. How the Ukrainian Resistance can possibly end? This is the point where no one could predict the outcome. Will Russia allow the neighboring government to ease the pressure of the controversial laws they passed? It is an ultimate fight for Russia as well. Ukraine is a cornerstone of Putin’s dream of a new Russian Empire. They will not cease their grip on Ukraine. Why violence started in Kyiv? The violence is a part of is a script produced in the Kremlin. This is something that Moscow needs. Yanukovych is bought by Putin and intimidated by Putin. Some of his inner circle desires more power. It began to show a while ago, but November 30 and January 16 were the days when this government’s true face was fully revealed. The so-called “Opposition,” and especially its three “leaders” (as people call them, “three little piggies”), showed a complete lack of ingenuity and acted like puppets. Meanwhile, the People got organized and continue to organize themselves, although, unfortunately, the People also have to spend time explaining to other nations something that has already long been self-evident – e.g., systemic corruption, canary courts, atrocities committed by the Ukrainian law enforcement against their own citizens, a total lack of accountability in local government offices. There is no legal way to cancel unconstitutional laws restricting civil freedoms since the courts in Ukraine are currupt, including the Constitutional Counrt. What had really triggered the violence? Yanukovych has usurped political power in 2010, when the Ukrainian Constitution was revised. Back then, the society bought into that, but the tension accumulated. The explosion came when the leaders of the parliament and of the ruling Party of Regions usurped the right to manufacture laws without proper voting procedure foreseen by the Constitution. Even the votes were not counted when the “laws” were “adopted” on January 16 2014. As far as the “radical actions” are concerned: apparently, they were initiated by members of radical right-wing political movements and football fans and provoked by agent-provocateurs of the Ukrainian government and/or of Russia. Yet, because the powers-that-be kept ignoring peaceful protesters for two months, this radicalism spread on masses. Those who protested peacefully became “radicals.” Right now, we do not have “peaceful protesters” and, separately, “radicals;” those are the same people. Also, the extent to which the society supports those who act in a “radical” fashion during the protest rallies is much greater than the support of radical right-wing political forces. How harmful to democracy are the new Ukrainian laws? What intimidation methods were used there? Are the intimidation techniques Russian-inspired? These practices are inspired by many regimes where law is not respected. When Yanukovich became President, he appointed as chiefs of the police, army and security the people who were Putin’s stooges. This is no hype. Some of them have Russian citizenship. So, now Russia can control the course of events without Yanukovych. In Russia, a significant part of politicians consider it necessary to annex some areas of Ukraine together with their population, because they worry that the percentage of Russians in their country is decreasing. To do this, they want to have a reason to send peacekeeping troops to Ukraine. This is the scenario of Transnistria, Abkhazia, Ossetia. Only this can explain why Yanukovych says one thing and Golden Eagle (Berkut, special troops) does another. But we are different from the Abkhazians and others mentioned above: the war will take place in a country where there are nuclear power plants. Therefore, it is not only our big concern, but also a big concern for the whole world, especially the Europe. NGO Maidan Monitoring Information Center. 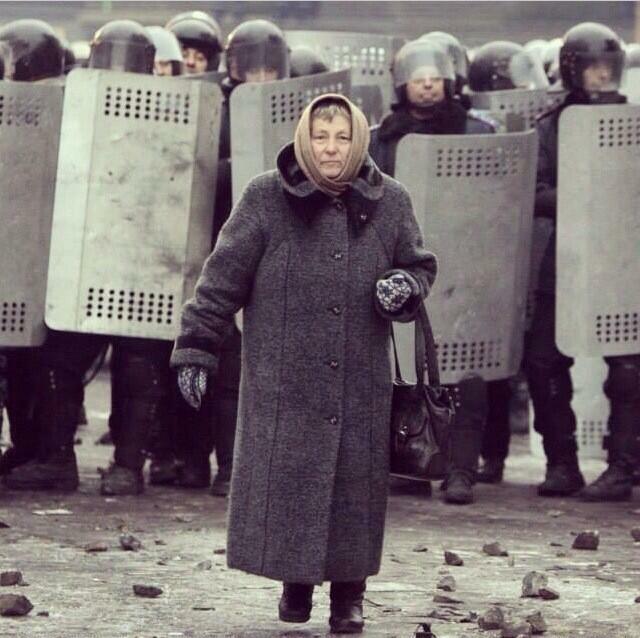 A lady in Kyiv in front of Berkut to stop them from shooting.